High-speed railway (HR, Electrified railway with service speed above 200 km/h.) noise and conventional railway (CR, Electrified railway with service speed under 200 km/h.) noise are different in both time and frequency domain. There is an urgent need to study the influence of HR noise and consequently, develop appropriate noise evaluation index and limits for the total railway noise including HR and CR noise. 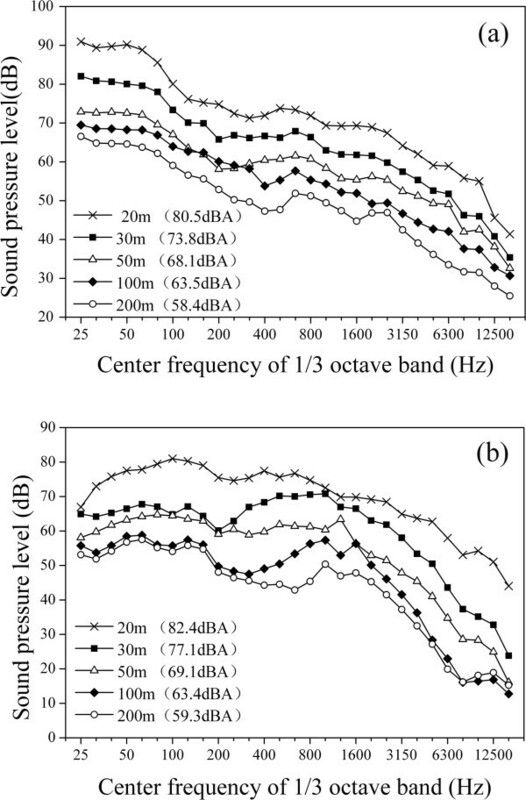 Based on binaural recording of HR and CR noises in a approximate semi-free field, noise annoyance and activity disturbance induced by maximal train pass-by events in China were investigated through laboratory subjective evaluation. 80 students within recruited 102 students, 40 males and 40 females, 23.9 ± 2.1 years old, were finally selected as the subjects. After receiving noise stimulus via headphone of a binaural audio playback system, subjects were asked to express the annoyance or activity disturbance due to railway noise at a 0-100 numerical scale. The results show that with the same annoyance rating (A) or activity disturbance rating (D), the A-weighted equivalent sound pressure level (L Aeq) of CR noise is approximately 7 dB higher than that of HR noise. Linear regression analysis between some acoustical parameters and A (or D) suggests that the coefficient of determination (R2) is higher with the instantaneous fast A-weighted sound pressure level (L AFmax) than that with L Aeq. A combined acoustical parameter, L HC = 1.74L AFmax + 0.008L AFmax(L p-L Aeq), where L p is the sound pressure level, was derived consequently, which could better evaluate the total railway noise, including HR and CR noise. More importantly, with a given L HC, the noise annoyance of HR and CR noise is the same. Among various acoustical parameters including L HC and L Aeq, A and D have the highest correlation with L HC. L HC has been proved to be an appropriate index to evaluate the total railway noise, including both HR and CR. However, it should be pointed out that this study provides suggestive evidence, rather than a final proof. Further study is expected to elucidate conclusions above by additional measurements. The research on high-speed railway (HR) noise has attracted more and more attention. The train noise consists of various sources, such as wheel/rail noise and aerodynamic noise. The aerodynamic noise depends strongly on train speed . In a study of Shinkansen train, which is the high-speed railway train in Japan with the maximum speed of 240 km/h ~320 km/h, it was shown that the aerodynamic noise was dominant sound source of the train noise when the train speed exceeded 270 km/h [2, 3]. Moreover, the duration of HR noise is normally shorter than that of conventional train noise. 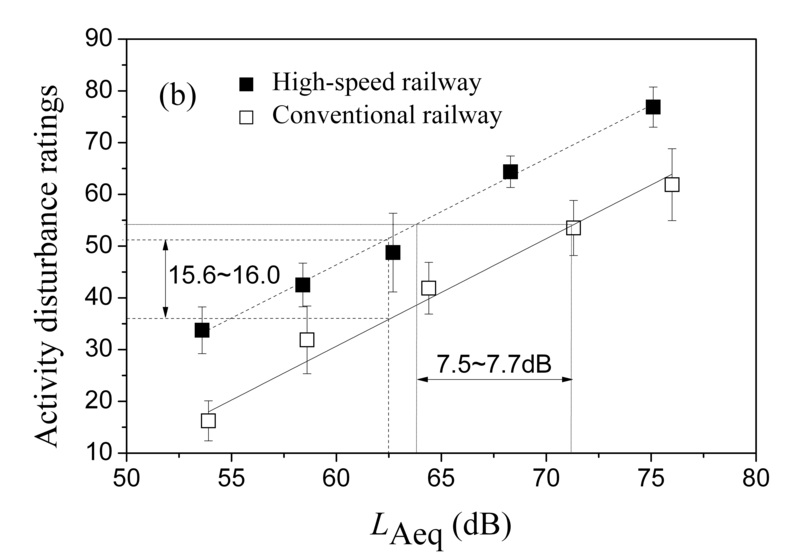 Consequently, the HR noise and conventional railway (CR) noise are different in both time and frequency domain. Compared with CR noise, the magnetic levitation railway (MLR) noise is more similar to HR noise [4, 5]. The results obtained by field surveys or laboratory studies could provide supports for setting standards for traffic noise. A number of field surveys on CR noise have been carried out in different countries . Commercial HR systems have been built in a number of countries, including Japan, France and China, but there have been limited reports on the field surveys of HR noise. When Shinkansen was opened in 1964, its noise caused a lot of complaints. As there was no special evaluation standard for this new traffic noise, a field survey was carried out by the Environmental Agency of Japan. Based on the results, the maximum A-weighted equivalent sound level, L ASmax, with the time duration as 1000 ms, was selected to evaluate the HR noise . In 1993, a field survey was carried out to assess the impact of noise induced by the TGV Atlantique line in France . Whilst the A-weighted equivalent sound pressure level, L Aeq, seemed to be a relevant noise annoyance descriptor for the daytime, the number of noise events or the length of time over 70 dB (A) seemed to be more appropriate for the evening. Based on a field survey in Shanghai on the magnetic levitation rail (MLR) noise impact, Chen et al  found that L ASmax is more appropriate than L Aeq as a noise descriptor. Meanwhile, some researchers have compared the impact of the noises from CR, HR and MLR under laboratory conditions. In two relevant laboratory studies reported by Fastl and Gottschling [10, 11], the overall (or global) loudness ratings for the MLR and CR noise, with the same L Aeq, were not significantly different. However, in a laboratory study reported by Neugebauer and Ortscheid , the subjects were more negative about MLR than CR. Moreover, especially at a higher L Aeq, the sounds from MLR were considerably louder than those of CR. In a laboratory study reported by Vos , the annoyance degree caused by MLR was also considerably higher than that by CR. In a study reported by De Coensel et al , a holiday cottage was selected as a natural setting, and subjects were asked to engage in simple daily activities during the tests. Using fixed outdoor loudspeakers, railway noise was reproduced. After noise exposure, subjects were asked to evaluate the noise annoyance. The results, however, showed that there was no significant difference among the annoyances caused by CR, HR or MLR noise at same L Aeq. Overall, the above results are inconsistent, which might be caused by the use of different stimuli. According to a laboratory study reported by Di et al , there is a strong correlation between the annoyance and the burst duration and interval time of intermittent noise. In the studies reported by Fastl and Gottschling [10, 11], Neugebauer and Ortscheid  and Vos , pass-by sounds were used and each stimulus included only one noise event. The stimuli used by De Coensel et al  included several pass-by sounds. In China, the total mileage of HR has exceeded 6900 km since the first HR was put into operation in 2008. However, no special sound environment quality standard for the area along HR has been set up in China. GB 3096-2008 , which is an “Environmental Quality Standard for Noise” of China, provides evaluation indices and noise limits for different sound environment function areas including the area along CR, i.e. the existing noise limit developed for CR noise is also used for HR. Many residents living along the HR have complained about the noise impact from HR [16, 17], so that there is an urgent need to study the influence of HR noise and consequently, develop appropriate noise index and limits. In this study, therefore, based on binaural recording of HR and CR noises in a approximate semi-free field, the noise annoyance and activity disturbance have been investigated through laboratory subjective evaluation. The aim is to examine the effects of different acoustical parameters, develop appropriate noise evaluation methods and indicators of total railway considering the two kinds of railway noise. The Artificial Head Measurement System HMS IV.0 (Head Acoustics, 2008) was used to sample HR and CR noises, and a digital video recorder was used to record the pass-by trains. The ear height was 1.2 m above the ground . 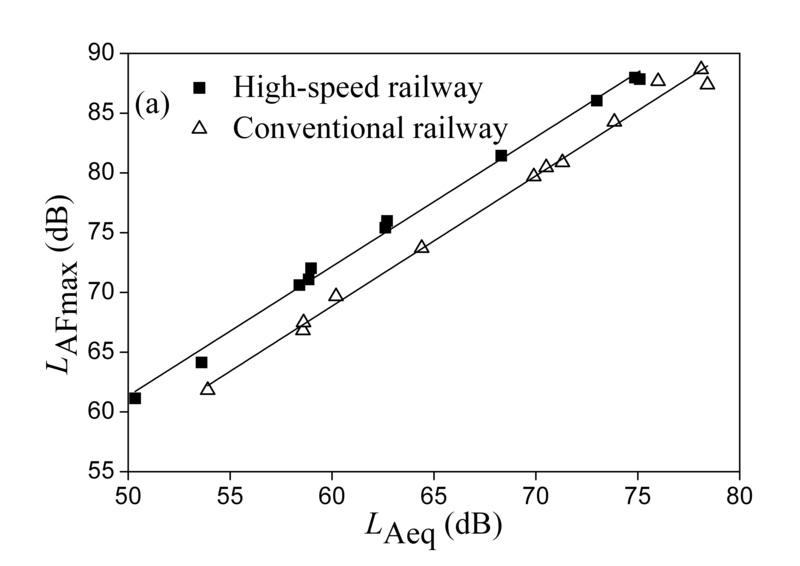 Acoustical characteristics of railway noise are pertaining to train type and rail track. The most representative train type and rail track was chosen in this study in order to that the research results can be generalized to railway system of China as far as possible. It was also confirmed by the Ministry of Railways of the People’s Republic of China that the train type and rail track of HR and CR chosen below has been most widely used now and will be generalized in the future in the railway network of China, especially in the high-speed railway network. The HR noise was recorded in a semi-free open field along the Shanghai-Hangzhou HR, where rail level was 15 m higher than ground and the background noise was lower than 35 dBA. The recording was made at different distances from the HR, reflecting the attenuation characteristics. 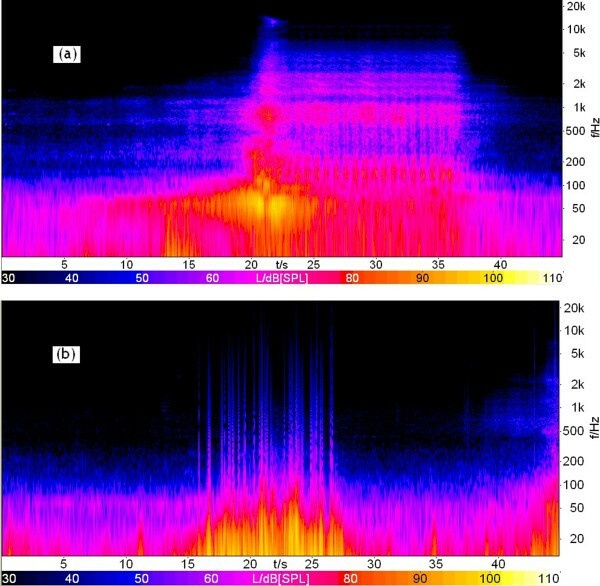 In an experiment reported by Kurra , the noise was recorded at 30 m and 100 m from the outboard track. In the experiment reported by Vos , the noise was recorded at 25 m, 50 m and 100 m from the outboard track. In the experiment reported by De Coensel et al , the recording distance was 25 m, 50 m, 100 m and 200 m from the outboard track. In this study, the recording distance was 20 m, 30 m, 50 m, 100 m and 200 m from the outboard track. During the recording, the pass-by trains were of same type (CRH380A, 8 railroadcars), and the speed was 301 ± 3.6 km/h. The CR noise was recorded in a semi-free open field along the Zhejiang-Jiangxi CR, where rail level was 2.3 m higher than ground and the background noise was also lower than 35 dBA. The recording distances corresponded to those of HR recording. During the recording, the pass-by trains were of same type (SS8, 17 railroadcars), and the speed was 107 ± 10.7 km/h. Considering that train noise actually varies from train to train even if the trains are moving with the same speed as the wheel conditions for different trains are not identical, the pass-by trains of same type were recorded 8 times at each distance from the outboard track. where L L is the level of the left signal (dB), and L R is the level of the right signal (dB). The difference between L L and L R is less than 1.0 dB.The sound pressure level (SPL) in 1/3-octave bands are illustrated in Figure 1 for each sound fragment. It can be seen that with increasing frequency, the HR SPL decreases continuously, and this tendency is relatively less significant for CR. To examine this in more detail, a time-frequency analysis of the noise recorded at 20 m from the outboard track has been carried out, as shown in Figure 2. It can be seen that the low frequency noise of HR is more prominent compared with CR. SPL in 1/ 3-octave bands for 10 sound fragments. (a) High-speed train (HR); (b) Conventional train (CR). A time- frequency analysis of railway noises recorded at 20 m from the outboard track. (a) CR; (b) HR. In the laboratory study of traffic noise reported by De Coensel et al , Kurra , Vogt  and Sandrock et al , the test duration for subjective evaluation was 10-30 min. In the experiments where the duration of 30 min was used, subjects were asked to engage in two activities . In other experiments, subjects were asked to engage in only one activity. In this study, 15 min was used as the test duration, which included six pass-by sounds with a constant interval that was determined based on train schedule, where the maximum train pass-by was approximately 24 per hour. In the studies carried out by De Coensel et al  and Kurra , a similar train frequency was used. During the test of activity disturbance, subjects were asked to engage in one activity, as described below. The noise annoyance and activity disturbance induced by maximal train pass-by events in China (six pass-by sounds with a constant interval over 15 min) were investigated through laboratory subjective evaluation. The binaural audio playback system consisted of four headphones (Sennheiser HD-600), a distribution amplifier (Head AcoustiAS HDA IV. 1) and a digital equalizer (Head AcoustiAS PEQ V). Headphones outputs were calibrated at the calibration laboratory of the HEAD acoustics GmbH. The differences of sound pressure level between nominal value and actual value for left channel or right channel of Headphones are all lower than 0.05 dB. The experiment was performed in a soundproof room (4 m by 4 m by 3 m), where the background noise was lower than 25 dBA. In the first stage 102 students were recruited to take part in a hearing test, which was performed using an audiometer to test the hearing loss of each student. After excluding one student having an obvious hearing loss (>15 dB)  and 21 students whose curriculum schedules were conflicting with scheming experimental timetable, 80 students, 40 males and 40 females, 23.9 ± 2.1 years old, were finally selected as the subjects for subjective evaluation experiments. Since the binaural audio playback system consisted of four sets of headphones, only four subjects could receive noise exposure at the same time through headphones. 80 subjects were divided into 20 groups randomly. Each group included 4 subjects. Two independent experiments, annoyance and activity disturbance induced by railway noise, were carried out, respectively . A numeric rating scale [24, 25] was used to evaluate annoyance and activity disturbance induced by noise in this study. Before experiments, the subjects were told that the purpose of this experiment was to evaluate the annoyance and activity disturbance induced by railway noise. They were also asked to imagine they were in the outdoor environment and the recorded environmental background noise and video along the railway were presented by a dodecahedron loudspeaker and a television . When experiments began, the dodecahedron loudspeaker was turned off and subjects received noise stimulus via headphone of a binaural audio playback system above. Previous study [27, 28] reported that the visual settings influenced judgments on annoyance induced by noise. In order to reduce the impact of visual setting on the study, it is necessary to reproduce the original scene truly. In this study, the recorded video, including pass-by trains, was played back simultaneously with sounds. In the experiment of activity disturbance induced by noise, subjects were asked to select magazines to read individually during noise exposure . After above noise exposure, subjects were asked to express the annoyance or activity disturbance due to railway noise at a 0-100 numerical scale , where 0 means ‘Not at all’, and 100 means ‘Extremely’ [24, 30–33]. Since all the subjects in this study were university students with good English level, the evaluation sheet was both in English and Chinese. The annoyance rating (A) and activity disturbance rating (D) of each noise sample was calculated by averaging scores chosen by all subjects. Acoustical parameters (such as L Aeq, L AFmax, L N, etc.) of each noise sample were calculated by ArtemiS 10.0 software. All statistical analyses were performed by Origin 7.5 (OriginLab Corporation, Northampton, MA, USA). Three kinds of regression models, including linear model, second-order polynomial model and exponential model, were used to examine relationships between A ( or D) and each single acoustical parameter above. The regression model with the highest determination coefficient was given. In order to further develop an appropriate evaluation index for the total railway noise including HR and CR, a multiple regression model was used to examine relationships between combined acoustical parameters and A ( or D) of overall railway noise, including HR and CR. L AFmax and L p-L Aeq were chosen as acoustical parameters in multiple regression model which was given as below. where a1, a2, b1, b2, c1, c2 are all constant terms. The relationships between A and L Aeq , and between D and L Aeq . (a) Between A and L Aeq. HR: A = 2.05L Aeq-72.9 (R 2 = 0.993); CR: A = 2.06L Aeq-86.6 (R 2 = 0.991); (b) Between D and L Aeq. HR: D = 2.06L Aeq-77.0 (R 2 = 0.994); CR: D = 2.08L Aeq-94.1 (R 2 = 0.978). From the above it can be derived that with the same L Aeq, A of HR noise is approximately 13.0-13.2 higher than that of CR noise. With the same A, L Aeq of CR noise is approximately 6.3-6.4 dB higher than that of HR noise. Compared with CR noise, for HR noise the peak level of train events (L Amax) and the proportion of low frequency sound energy are generally higher and the duration of noise is shorter [8, 10, 14], which could result in greater annoyance of HR noise compared with that of CR noise at the same L Aeq. Figure 3 (b) shows the relationship between D and L Aeq. Similar to the relationship between A and L Aeq, with increasing L Aeq, D increases, and the relationship for HR can be given below, where the coefficient of determination (R 2) is 0.994,. It can be derived that with the same L Aeq, D of HR noise is approximately 15.6-16.0 higher than that of CR noise, whereas with the same D, L Aeq of CR noise is approximately 7.5-7.7 dB higher than that of HR noise. Using multiple regression model, the relationships between combined acoustical parameters and A, D of overall railway noise, including HR and CR, were obtained as Eq. (8) and Eq. (9), where R 2 are 0.991 and 0.977, respectively. Defining L HC = 1.74L AFmax + 0.008L AFmax(L p-L Aeq), equations above can be simplified to Eq. (10) and Eq. (11) as below. Comparing with linear regression models having single acoustical parameter in Table 1, the determination coefficient (R 2) of the multiple regression model having combined acoustical parameters is higher. aover 15 min, bover just 45 s.
To develop the environmental noise limits, the practicality should be also considered. It would be useful to develop a single index which could be applied for both HR and CR noise, namely, with the same limit value when such an index is used. In addition to L Aeq, relationships between some acoustical parameters and the subjective evaluation results have been analyzed. The acoustical parameters include sound exposure level, SEL, which is a indicator on the total noise energy produced by a single noise event; the maximum of the instantaneous fast A-weighted sound pressure level with a duration of 125 ms, L AFmax; the maximum of the instantaneous slow A-weighted sound pressure level with a duration of 1000 ms, L ASmax[34, 35]; the percentile levels, L A10, which is exceeded by 10% of measured data during the total measurement time period; in particular , the effective perceived noise levels, L EPN, which can be obtained by analyzing one pass-by sound, based on the calculation method reported in ISO 3891-1978 ; and four psychoacoustics parameters including loudness levels (L N), the sound pressure level of a 1 kHz tone sounding as loud as a noise event; sharpness (S), an index describing high-frequency characteristics of a sound sample; roughness (R), an indicator on sound qualities associating with amplitude modulations caused by tones above 20 Hz; and fluctuation (F), an indicator on sound qualities associating with amplitude modulations caused by tones below 20 Hz , both over 15 min including quiet periods and over just 45 s. The results are shown in Table 1. Generally speaking, the ambient noise is not only from one source. Considering combinations of various noise sources, L Aeq is the most commonly used noise descriptor in environmental noise standards and regulations. As shown in Table 2, L Aeq is also the most important index for evaluating railway noise. In addition, L AFmax and L ASmax are normally selected to evaluate the noise with impulsive character. L AFmax has been used for emission values for trains . L ASmax was selected to evaluate the HR noise by the Environmental Agency of Japan  and Taiwan . *Moderate sound environment zones are the areas where the environmental noise level existing before the new infrastructure. **Daytime is divided into morning (5:00-7:00), day (7:00-20:00) and evening (20:00-22:00). Table 3 shows the L Aeq and L p over 15 min for different stimuli sampled at different distance from the outboard track. As shown in Table 3, the differences between the total un-weighted SPL and L Aeq (L p-L Aeq) were 20.0-24.7 dB for HR noise, and 8.3-15.4 dB for CR noise. This suggests that compared with CR noise, the proportion of low frequency sound energy is larger for HR noise, which could result in greater annoyance of HR noise compared with that of CR noise at the same L Aeq. 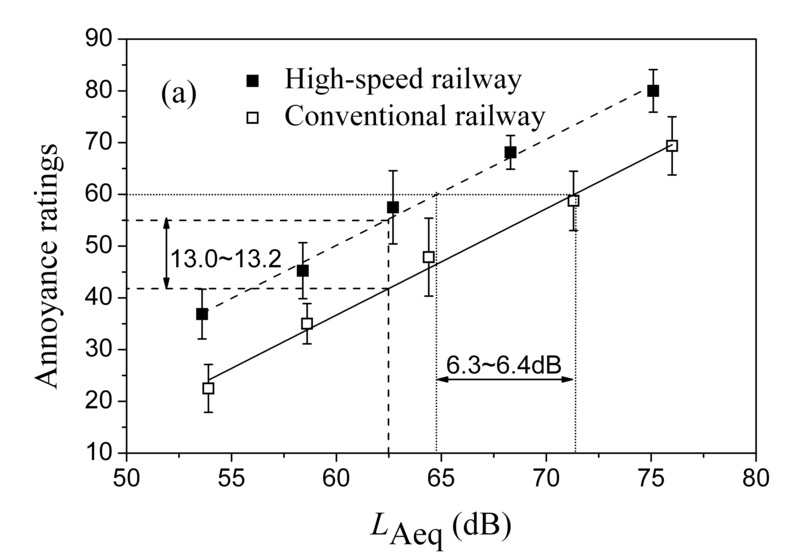 Through a detailed analysis, it has been proved that the higher low frequency content compared with that of CR could not be due to the noise summation within “no train” period in Figure 2. Generally speaking, as the propagation distance increases, the proportion of low frequency sound energy would also increase. Consequently, L p-L Aeq of CR noise increases monotonically, with increasing distance from the outboard track. For HR, however, due to the influence of elevated track, the L p-L Aeq does not increase monotonically. aThe distance between noise sampling site and the outboard track. 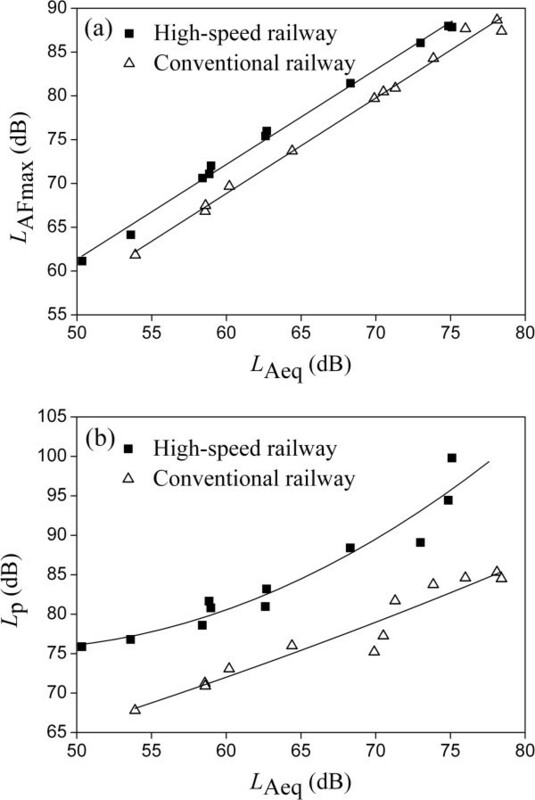 As a combined acoustical parameter proposed to evaluate the total railway noise, L HC = 1.74L AFmax + 0.008L AFmax(L p-L Aeq), where L AFmax could express the influence of impulsive character, and L p-L Aeq could express the influence of low frequency character, which is very different between HR noise and CR noise as shown in Figure 1 and Figure 2. As a result, it is expected that both HR and CR can be taken into account in the same set of equations. L p-L Aeq will decrease with the interval of train pass-by events increasing, i.e., the influence (A or D) induced by railway noise will decrease and be lower than that of maximum train pass-by events. Compared with regression models of A and D in L Aeq for only HR noise or CR noise (Eq. (4) - Eq. 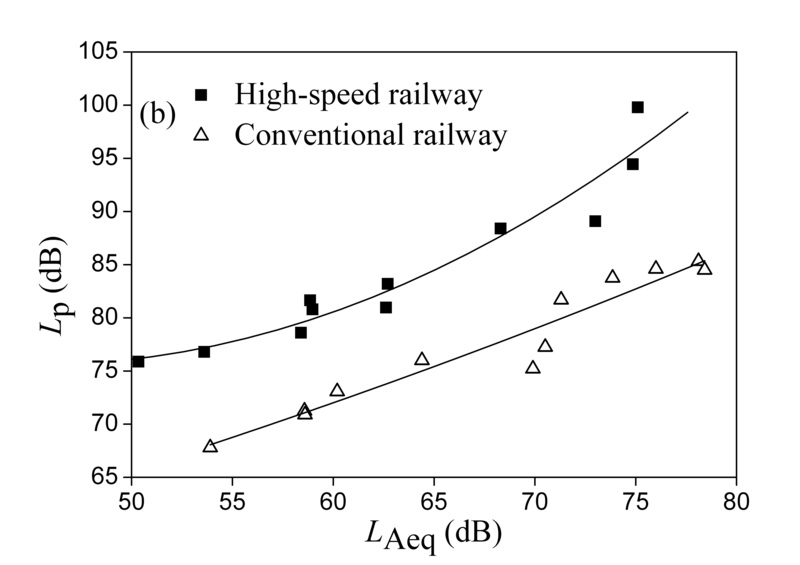 (7)), the combined model of L HC for total railway noise (Eq. (8) and - Eq. (9)) has additional advantages as discussed below. In Figure 4 the relationships between acoustical parameters of HR noise and CR noise are given. According to the regression equations between L AFmax and L Aeq, and between L p and L Aeq, as shown in the caption of Figure 4, it can be calculated that when L Aeq is 60.0 dB, L AFmax and L p of HR are 72.0 dB and 82.1 dB; and L AFmax and L p of CR are 68.8 dB and 71.9 dB, respectively. When L Aeq is 70.0 dB, L AFmax and L p of HR are 82.8 dB and 91.6 dB; L AFmax and L p of CR are 79.7 dB and 78.9 dB, respectively. Then they are substituted into Eq. (8), and when L Aeq is 60.0 dB and 70.0 dB, the difference in A between HR noise and CR noise is 11.7 and 14.0, which is not identical. However, according to Figure 3 or Eq. (4) and (5), when L Aeq is 60.0 dB and 70.0 dB, the difference in A between HR noise and CR noise is 13.1 and 13.0, which is basically identical. Similar results about the difference in D between HR noise and CR noise can be derived from Eq. (6), (7) and (9) when L Aeq is 60.0 dB and 70.0 dB. The relationships between L AFmax and L Aeq , and between L p and L Aeq . (a) Between L AFmax and L Aeq. HR: L AFmax = 1.08L Aeq + 7.2 (R 2 = 0.995); CR: L AFmax = 1.09L Aeq + 3.4 (R 2 = 0.994); (b) Between L P and L Aeq. HR: L p = 0.023L Aeq 2-2.04L Aeq + 121.7 (R 2 = 0.928); CR: L p = 41.443 e 0.0092 L Aeq (R 2 = 0.934). In fact, based on the regression equations between L AFmax and L Aeq, and between L p and L Aeq given in the caption of Figure 4, Eq. (12) for HR noise and Eq. (13) for CR noise between L HC and L Aeq can be derived as follows. According to Eq. (8), (9), (12) and (13), L HC of HR and CR noises with same A were calculated and were listed in Table 4. Results indicate that L HC of HR and CR noises with same A is identical basically. These results above suggest that compared with the single model in L Aeq for only HR noise or CR noise, the combined model using L HC for total railway noise can distinguish the difference of A (or D ) between HR noise and CR noise with different L Aeq. Moreover, when L Aeq of HR is 63 dB and L Aeq of CR is 70 dB, whose annoyance (A) is the same, L HC is approximately 126; when L Aeq of HR is 53 dB and L Aeq of CR is 60 dB, L HC is approximately 144. In other words, if A of HR noise and CR noise with different L Aeq is the same, L HC will be identical. As a result, compared with L Aeq, L HC would be a better evaluation index of total railway noise. This can also be seen in Table 1, where among various acoustical parameters including L HC, L Aeq, SEL, L AFmax, L ASmax, L A10, L EPN, L N, S, R and F, A and D have the highest correlation with L HC. In many cases, HR and CR noises are coexistent in an actual environment. As the limits of both HR noise and CR noise are different in L Aeq, each noise has to be distinguished and measured from total railway noise. However, the limit of L HC of both HR noise and CR noise is identical, so two types of railway noises can be measured synchronously. When there are combinations of various noise sources, such as railway and road traffic , L Aeq might be a more general noise evaluation index. However, a single index, L Aeq, would not be sufficient to evaluate the influence of railway noise, as discussed above, it might be possible to use multiple indices such as L Aeq, L p and L Amax (L AFmax or L ASmax). There might be also a scope of modifying L HC for combined noise sources. It must be noticed that use of young students with perfect hearing in this case study may limit generalizability of findings. More subjective evaluation experiments or epidemiological investigations covering different age and occupation groups may extend the generalizability of findings. In addition, subjects were given a video of the train passing during the noise exposure. It means that subjects could have identified which was high speed train and which was conventional train. This maybe introduced a bias into the subjective reporting of annoyance and activity disturbance. Based on binaural recording of high-speed railway and conventional railway noises in a semi-free field, the noise annoyance and activity disturbance induced by maximal train pass-by events in China (six pass-by sounds with a constant interval over 15 min) were investigated through laboratory subjective evaluation. With the same annoyance rating (A) or activity disturbance rating (D), the A-weighted equivalent sound pressure level (L Aeq) of CR noise is approximately 7 dB higher than that of HR noise. Linear regression analysis between some acoustical parameters and A (or D) suggests that the coefficient of determination (R2) is higher with the instantaneous fast A-weighted sound pressure level (L AFmax) than that with L Aeq. A combined acoustical parameter, L HC = 1.74L AFmax + 0.008L AFmax(L p-L Aeq), where L p is the sound pressure level, was derived consequently, which could better evaluate the total railway noise, including HR and CR noise. More importantly, with a given L HC, the noise annoyance of HR and CR noise is the same. When there are combinations of various noise sources, there might be a scope of modifying L HC. It should be pointed out that this study provides suggestive evidence, rather than a final proof. As a laboratory study involving students in their 20s (not a general population with naturally experienced levels of noise) with potential bias from being able to clearly identify which train was which, the results and conclusions above could have potential limitations. Further study is expected to elucidate conclusions above by additional measurements. Distance between the noise sampling site and the outboard track. This research is supported by National Public Industry Research Fund in China (No. 200809142) and National Natural Science Foundation of China (No. 11174251). All authors have read the final version of the manuscript and have given final approval of this version of the manuscript to be published. GQD conducted the study design, data analysis and completed the final version of the manuscript. QLL planned the experiment, execution of data collection and prepared the first draft of the manuscript. ZGL assisted in the analysis of the study data, participated in the writing of the manuscript. JK participated in the study design, and critically reviewed the manuscript. All authors read and approved the final manuscript.